If you haven’t run across it yet, About.com has a fairly extensive cocktail cocktail site set up. Helmed by Colleen Graham, the site includes a drink database, weekly articles, reviews, tips — just about everything you’d find in a paper-and-print cocktail guide. They’ve also started a monthly (sometimes bi-monthly) cocktail contest, featuring original drinks created by readers. November’s contest is themed “Bring Out Your Gin,” calling for an original gin drink. As Colleen admits, that’s a tall order: an original, when there are hundreds of gin drinks out there roaming libraries and the interwebs? Sounds like a challenge. Check out the Published Submissions page to see the other gin cocktails (most look mighty tasty!). Muddle the tarragon with the gin, liqueur, and lemon juice in the bottom of your shaker. Add the egg white and bitters and dry shake, then add ice and shake. 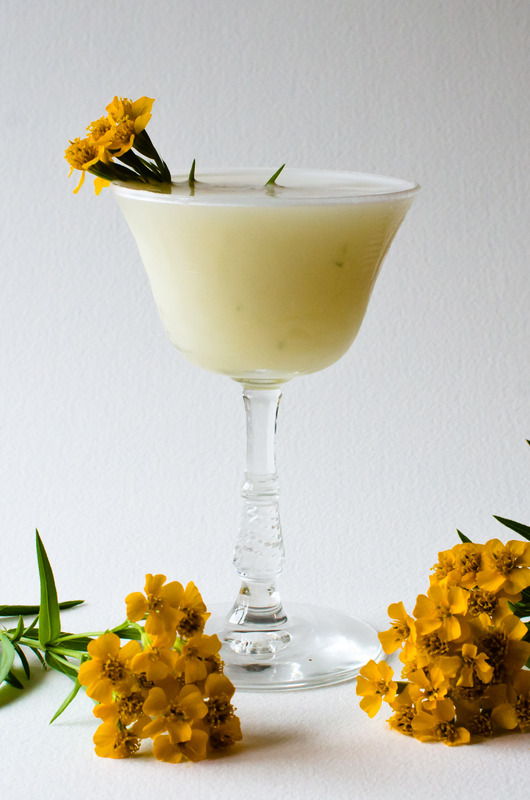 Strain into a chilled coupe and garnish with a tarragon flower. 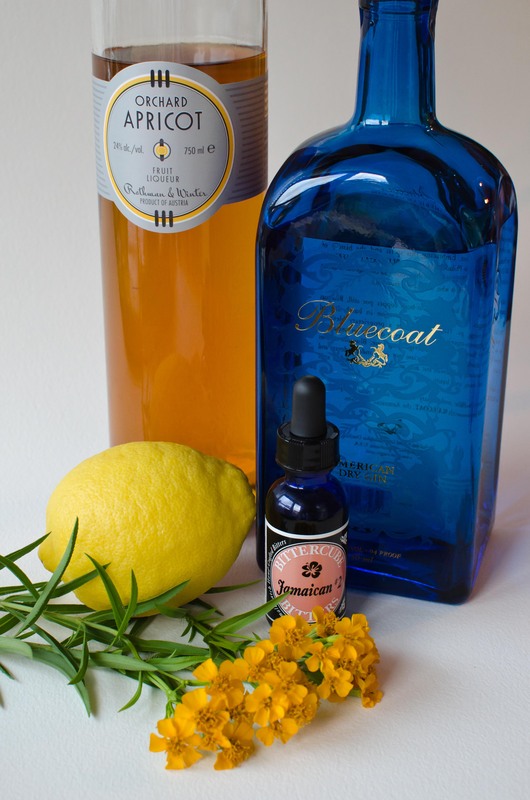 As I had just purchased a bottle of Bluecoat Gin, that was going to act as the base spirit. I figured lemon would be the sour ingredient for this one — lime and gin pair well together, especially in a Gimlet or the Last Word, but the flavor of lime seems less adaptable. Seeing as fresh herbs from our garden were a must, the sweetener could have been an herbal syrup, but I felt that pairing a fruit with the botanicals in the gin and the herb would work out particularly well. Grilled peaches with honey-mustard and rosemary being a family favorite, I went with something similar — apricot brandy and rosemary. After combining everything in a 2:1:1 formula and muddling the rosemary, the drink turned out fairly well: bright, herbal, and ice-cold, but lacking in a bit of depth and too heavy on the citrus. More apricot brandy was added — an improvement — and the drink was also tried with lavender, which was good, but very floral when muddled, though I think it won out over the rosemary. 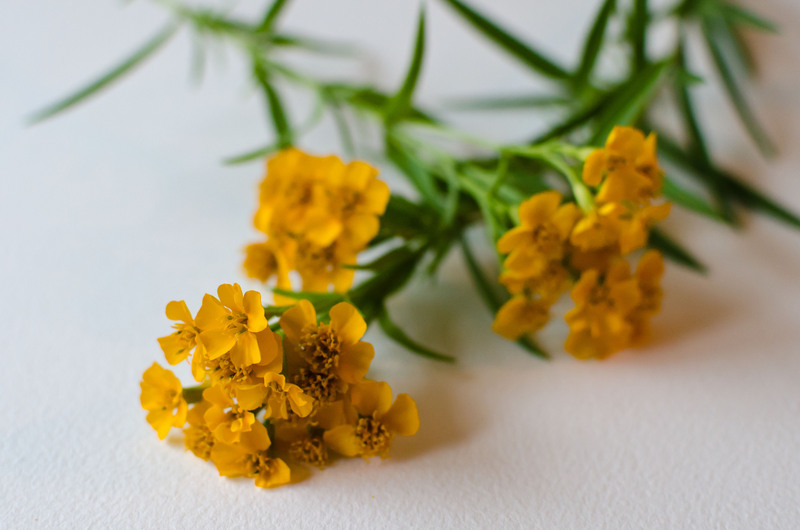 Mexican tarragon, of all things, finally seemed to fit the bill. Tarragon has an anise-like flavor and blooms in the Fall: it lent a nice bit of complexity to the gin-apricot-lemon combination I had going. Like most things anise- and mint-flavored, it has a bit of a cooling effect (probably from the oils). I should also note that Mexican tarragon has a stronger flavor and larger leaves than French tarragon, so you’ll have to use more leaves if using the latter. As a final ingredient, Bittercube’s Jamaican Bitters #2 have wonderful notes of grapefruit, hibiscus, and “island spices” — so noted on their bottle — adding some oomph and depth to the apricot and lemon. Orange bitters — particularly Regan’s — would also work well here, I think. Top everything off with a velvety texture and foam from the egg white — tarragon has long been a staple in scrambled eggs — and voila, a cocktail! The only question was, what to name it? Seeing as it used Philadelphia gin, Austrian liqueur, and Mexican tarragon, the “Immigrant” was an option, but I preferred something a bit more in keeping with the idea of a seasonal garden. Philadelphia Garden? Filly in the Garden? Hmm. As I mentioned in the post on the Widow’s Kiss, a favorite short story of mine is Ray Bradbury’s “Autumn Afternoon.” While the nostalgia-inducing Widow’s Kiss might match the old Aunt, the fresh, lively flavors of my new drink matched the bright personality of her young niece, Juliet…and the new drink had its name. As I came up with “Juliet’s Autumn” on the fly, I couldn’t be sure of its originality at the time, but after a little research I think my claim holds true. In basic composition it greatly resembles the “Barnum Was Right” and the “3-to-1,” and a quick check of CocktailDB yields four cocktails that combine gin, apricot, and lemon — I expected no less, given the ingredients. Among the related drinks are the Gloriana, the Peter Arno (made with mint, which is in short supply in our garden right now), the Resolute, and the Tender Cocktail. Only the proportions vary, but the many other drinks listed with the search terms “gin,lemon,apricot” seem tasty, including a number that add apple brandy to the mix. Only one other drink on CocktailDB combines the ingredients with anything resembling tarragon — the Apricot-Anise Fizz. One note on the egg whites: combining them with muddled herbs or fruits seems to be a rare move, probably because it’s difficult to strain the herbs out of the drink and maintain a nice foam on top. Juliet’s Autumn has a few flecks pf tarragon scattered through it, but remains free of larger chunks of the herb with the use of a hawthorne strainer. beautiful coupe! the drink sounds delicious, too. There’s a wonderful floral pattern that doesn’t show in this photo…just need a clear drink, instead of one involving egg whites! This entry was posted on November 9, 2011 by IJ Lauer in Apricot Brandy, Bittercube Bitters, Drink Recipe, Eggs, Gin, Lemon Juice, Original Drinks and tagged apricot brandy, bittercube, cocktail, drink, egg white, gin, juliet's autumn, lemon, original, recipe, tarragon.